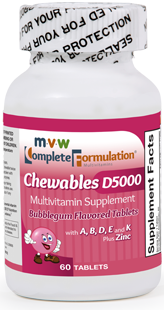 MVW Complete Formulation D5000 Softgels1 were developed to address the CF Foundation’s September 2010 multi-specialty ad hoc committee recommendations for age-specic, stepwise increases in vitamin D3 intake when optimum D status is not achieved from standard CF-specific multivitamin dosing. 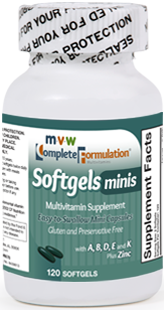 MVW Complete Formulation D5000 Softgels contain the same amounts of the fat-soluble vitamins A, E and K, and water-soluble vitamins and zinc as found in the standard MVW Complete Formulation Softgels for routine dosing, but provide 5000 IUs of D3 in each softgel to meet the “Step 2” dose increases recommended by the CF Foundation’s September 2010 Ad Hoc Committee recommendations. 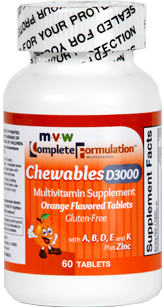 MVW Complete Formulation D5000 Softgels are red in color. 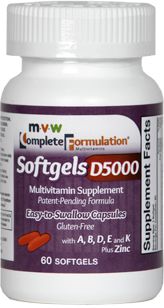 MVW Complete Formulation D5000 Softgels are safety sealed for your protection. If the safety seal is broken or missing, do not use and contact MVW Nutritionals immediately at 1-855-236-8584. To report a serious adverse event, please contact MVW Nutritionals immediately at 1-855-236-8584. Bottles of 60 softgel capsules. MVW Nutritionals – to place an order please call 1-855-236-8584 or 256-327-9830 to speak with a customer service representative.